Every little kid dreams on going on a party train ride, and now kids and adults will love to wave goodbye as they chug along the road in one of our trackless train rentals. 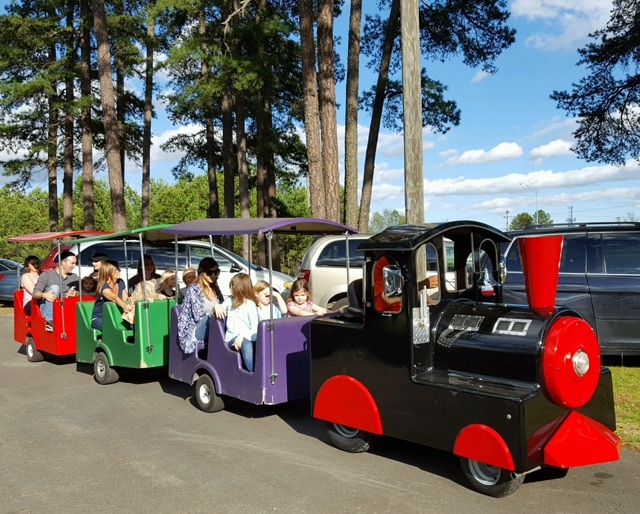 Since our party trains are trackless they can take you and your guests almost anywhere you want, around the block, to the park, through the parking lot and practically anywhere you find enough space on grass or paved surfaces. The train rides are powered by a potent "locomotive" that pulls 3 cars and can take up to 18 passengers at a time. Our trained "engineers" will make sure everyone in your birthday train party have an enjoyable and safe ride. This is the perfect entertainment for every train birthday party, or special event and after looking at your kids face once they go for a ride, you'll be in choo choo heaven! Riders should not exceed 2501bs each. Car capacity should not exceed 1500 lbs.